The taste of sulphur coated my tongue and the air clung to my skin as I emerged from the Beijing Capital International Airport on an unseasonably hot October night in 2007. I was on a whirlwind tour of the Asia-Pacific region as part of my work on an online network of universities. I was touching down in China’s capital for a 48 hour stay. I had not traveled in Asia and wasn’t sure what to expect. While my colleagues’ coaching prepared me for the logistics of the visit, it set off an enduring cultural commotion in me. My view of China was formed by my reading of books by Canadian journalists such as John Fraser’s “The Chinese: Portrait of a People” that discusses his involvement with the Xidan Democracy Wall movement in 1978 while he was Beijing correspondent for the Globe and Mail. Or Jan Wong’s autobiographical“Red China Blues: My Long March from Mao to Now” that includes her intense account of the Tiananmen Square protests of 1989. I came away from these books thinking China should and could be different, that it could embrace the ideals of democracy and freedom. After my visit, I’m not so sure. I find the complexity of China – its character and place in the world difficult to navigate. On one hand I willingly consume the cheap manufactured goods, while on the other I worry about the viability of the place where I live. The boundaries between government and business are indistinct at best, but in China they are even more so. I find this disturbing on both counts. There is no doubt that China will continue to have a huge impact on the way we live in Canada. It’s influence will grow as will the speed at which the changes take hold. 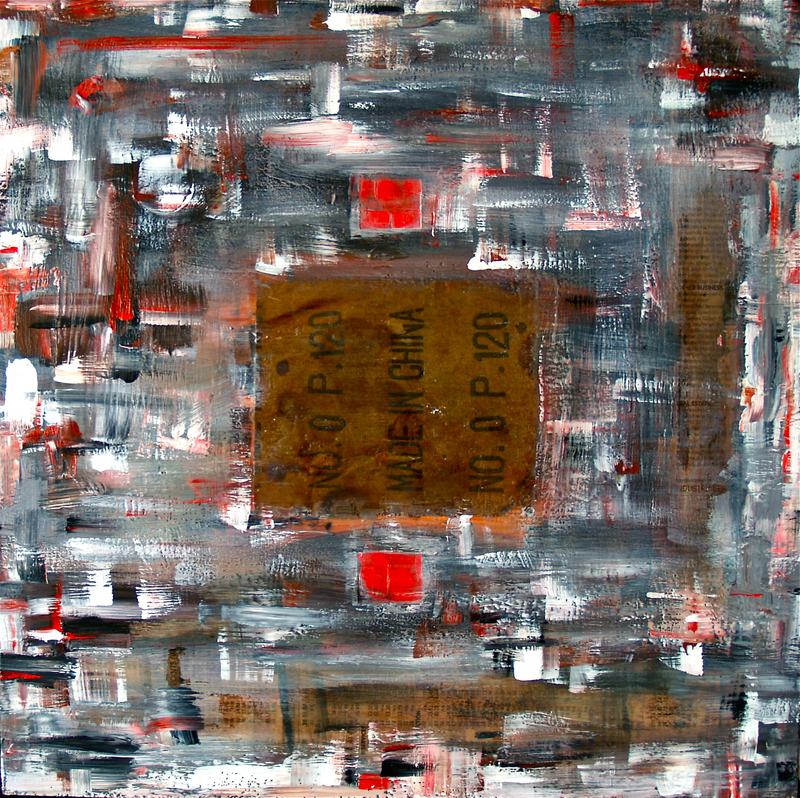 All these elements have influenced this mixed-media piece “Made In China”. This has been sitting on my easel for a couple of months. I kept returning to it thinking it needed more clarity, but just recently I began to find my visits to the work evoked my feelings and questions about China. So, “Made in China” stands as is; your comments are welcome. Talk about voices from the past. It’s Rod (your best Man) from many years ago. I saw your surname in a article I was reading and said to myself: Where is Dwight? The internet is great. In short, I’ve been here in New Glasgow, N.S. for 35 years working on air at CKEC/East Coast Fm. I used to be the P.D. and morning man, but things change. I’am married (Sandy) and I have a 31 year old daughter who lives in Moncton with her husband of 9 years. Where did the time go? I still fondly remember Emily Street and the dreams that lived there. Please give me best to Kathy.